Earlier this year we sold our first charity skin: PINK MERCY. This limited-time exclusive skin and accompanying themed apparel were created in partnership with the Breast Cancer Research Foundation to support our family and friends that have been impacted by this disease. Thanks to all of you, we were able to raise $12.7 million—the largest donation made by a corporate partner in a single year within BCRF’s 25-year history. 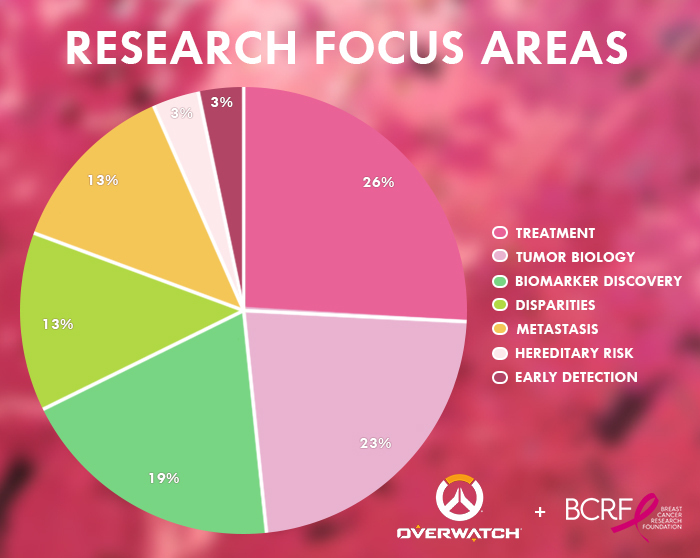 October marks Breast Cancer Awareness Month and, in the spirit of transparency, the Breast Cancer Research Foundation has graciously shared some insights on how the funds raised are being used to support research into understanding, preventing, and treating breast cancer. The donation of over $12.7 million will fuel three critical programs that examine every aspect of a breast cancer diagnosis and will change the lives of women and men across the globe: BCRF Precision Prevention Initiative, BCRF Translational Breast Cancer Research Consortium Award, and 25 Annual BCRF Research Grants. The Annual Research Grants Program is the core of BCRF’s mission. These awards provide scientists across the globe with funds to explore innovative ideas, to collaborate with fellow researchers, and to bring us closer to eradicating breast cancer. Your donations will fund 25 research grants, which will be distributed to studies in seven different research fields that focus on diagnosis and treatment. Once again, you’ve dared to see the world for what it could be and have helped take a significant step forward in the mission to cure breast cancer. For additional information, click here.